The Audi 5000 Type 44 was a significant car in automotive history, and rightfully recognized as such in the press, but due to their utility, you don’t often see surviving examples on the road. And if you do, they’re often gold front-wheel drive automatic examples that make for a less-than-exciting driving experience, or high-mileage, enthusiast-owned cars that will require significant maintenance. 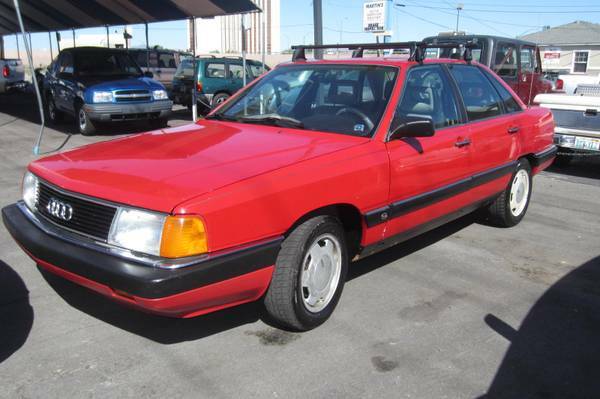 Today’s car has enough pluses to get an Audi enthusiast’s knees quivering – check out this 1987 Audi 5000 Turbo Quattro for sale for $1900 in Reno, NV. You can’t really talk about historically significant cars without the Audi C3 5000/100/200 coming up. Aside from being attractive cars that paved a new design direction, taking inspiration from Citroen and NSU, they also took Audi away from some of the rather frumpy designs of the previous years, particularly with the elegant Avant wagon. The flush windows, flush wheel covers, and aerodynamic design inspired many other manufacturers, most notably Ford with their Taurus. These cars were also built under license in various countries – in China as the Hongqi, primarily for government employees, in South Africa where many imported cars were built from CKD kits, and in Japan under a joint venture with the truck manufacturer Hino. They also took the 1983 European Car of the Year award, so 32 years after they were introduced (!! ), let’s check out a couple of examples. 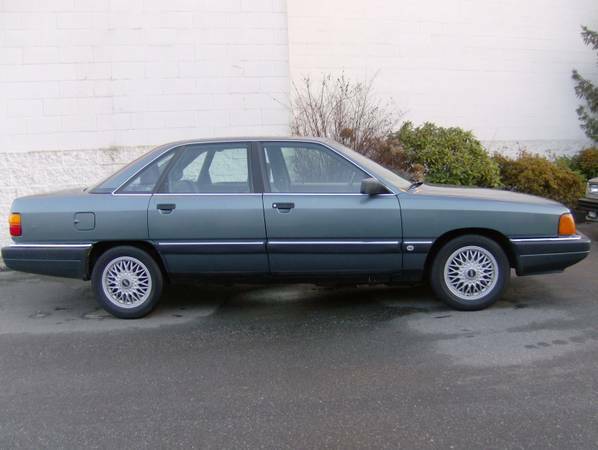 First off is this 1989 Audi 100 Quattro sedan, for sale for C$2500 in Abbotsford, BC. The C3-body Audi 100/200, debuting as the Audi 5000 in the North American market, holds a sad place in popular culture due to the I can’t tell the difference between two pedals unintended acceleration fiasco. That overshadows how revolutionary this car was when it came out – an extremely capable vehicle with a zinc-coated body and all-wheel-drive to get you through the snow and not fall apart while doing it. It also sported a futuristic design that was arguably the genus of the modern sedan, with flush headlights, flush doors/windows, and a generally wedgy shape. For its efforts, Audi earned the 1983 European Car of the Year award, and was on the 1984 and 1985 Car & Driver 10 Best list. Of course, that list also included the Renault Alliance and Pontiac 6000, so that was probably a back-handed compliment. 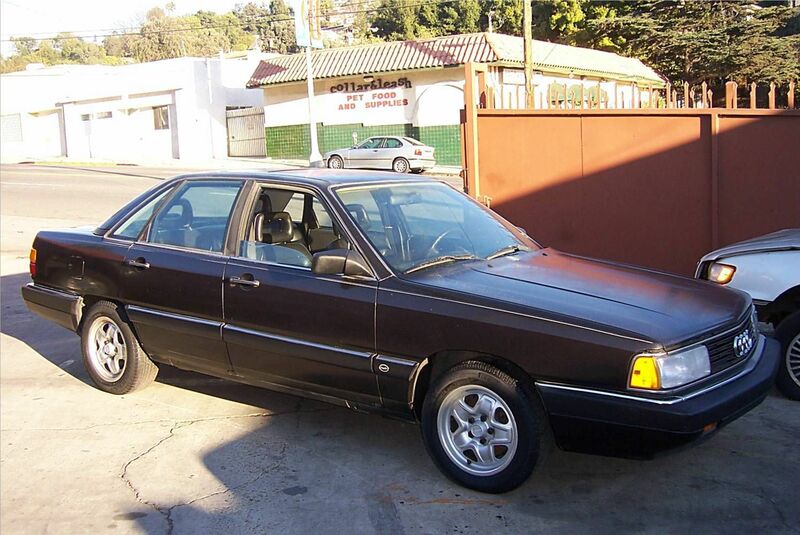 Anyhow, you can find this 1987 Audi 5000CS Quattro for sale in Los Angeles, CA with no bids, no reserve, a starting bid of $1000, and about 2 days to go on its second listing.